hey there, like to win? there may or may not be a giveaway hidden somewhere in this post! Jesus, Bread, and Chocolate: Crafting a Handmade Faith in a Mass-Market World by John J. Thompson. i am devouring this docu-memoir. there is something to be said for the correlation between our craving for the simple, organic, artisan, and our desire for pure, unadulterated faith. Thompson is saying it in this book. It's Not How You Look, It's What You See by Lisa Bevere. i heard Lisa speak at a conference this month and woah nelly, sister can preach. i don't know about the other 300+ women in the room but i felt like Lisa was talking directly to me. so i got this book- Lisa's story of her struggle with self-worth and body image, and her charge to stop measuring ourselves by the world's standards. i can. not. wait. to get into this book. Why My Kids Won't Get Their Own Instagram Account. i recently heard Craig Gross speak and then i read his investigation into Instagram. yall know i love IG! and i do believe social media can be used for good. but until there are better tools in place to protect my children from accessing (even accidentally) adult content, my kids won't be getting their own Instagram account. Baby Lips. i'm applying this neutral gloss all day every day, i love it so! Peach Kiss is my color. i never leave home without it. 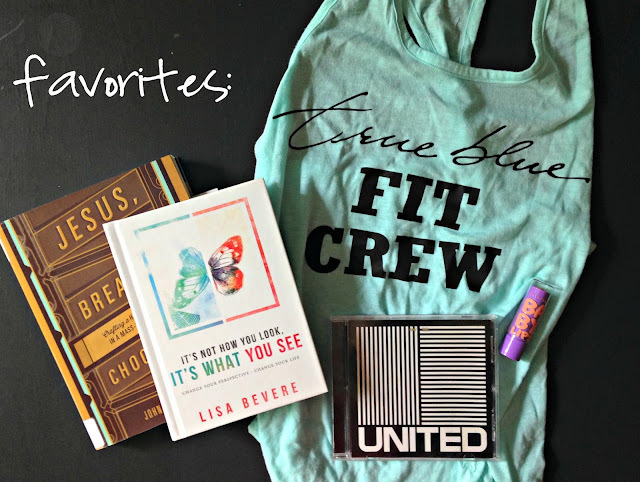 True Blue Fit Crew tank. represent! true blue fit crew beachbody team! Hillsong Empires. truth-inspired lyrics + beautiful voices + strong, fun music. Hillsong does it again with their latest album, Empires. have you heard "Touch the Sky"? oooh it's good. gives me chills. want a copy of the CD? leave a comment on the photo of the Empires CD @ my instagram to be entered to win ;) winner announced monday 6/1 on my IG. i'm linking up my favorites with one of my favorite friends (and fellow True Blue Fit Crew Coach!) Crystal @ Favorite Things Friday!